The hosts for the evening were David Slager, founding supporter of Chabad on Campus UK, Allan Freinkel, executive board member of the Chabad of Oxford, and Alan Lee, a supporter of Chabad of Bloomsbury. 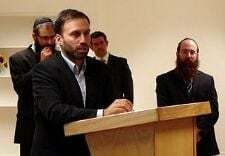 Communal philanthropist, Mendel Tajtelbaum, was the guest speaker. Reflecting on his experiences as the son of a Holocaust survivor, he spoke about the importance of teaching young people about Judaism as way to respond to the trauma of the Holocaust and to ensure Jewish continuity. 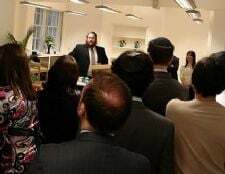 “With over twelve centres on campuses in ten cities across the UK, the audience reflects the local support that Chabad on Campus enjoys,” remarked Rabbi Eli Brackman, chairman of Chabad on Campus UK and director of Chabad of Oxford. David Slager, the principle supporter of Chabad on Campus UK, affixed a mezuzah to the door of the new venue. He then addressed the audience speaking about his appreciation for Chabad’s work while he was a student at Oxford University. Speaking on behalf of students, David Stern, a recent graduate, thanked Slager for his generosity and support for Jewish life on campus. “I don’t know what I would have done had it not been for Chabad on Campus at Nottingham University,” he said. In a video (click here) made especially for the event, students spoke about the positive impact Chabad on Campus has had in their lives. “Not only can I go to university and learn things that are on my course, but I can go to Chabad and learn a bit about Judaism which is really good,” said Meir Kojman, a student in Edinburgh where Rabbi Pinny and Gitty Weinman run a Chabad on Campus centre.